Suppressors of Cytokine Signaling (SOCS) family members are inhibitors of cytokine signaling pathways. Emerging evidence suggests the involvement of SOCS1 and SOCS3 in a variety of diseases, including allergy, autoimmune diseases, and inflammation. This study aimed to investigate the expression of SOCS1 and SOCS3 in the development of Henoch-Schoenlein Purpura (HSP) in children. Peripheral Blood Mononuclear Cells (PBMC) were isolated from children with HSP (HSP group, n=20) and healthy children (control group, n=15). The mRNA levels of SOCS1 and SOCS3 in PMBC were detected by Real Time Reverse Transcription-Polymerase Chain Reaction (RT-PCR). The results showed that the mRNA levels of SOCS1/3 were up-regulated in HSP group compared to control group (P<0.01). These data suggest that SOCS1 and SOCS3 mRNA levels are upregulated in children with HSP. Suppressors of cytokine signaling 1/3, Mononuclear cell, Henoch-schoenlein purpura, Children. Henoch-Schoenlein Purpura (HSP) is a major disease in the capillaries of allergic diseases, and is a common disease in children. In recent years, the incidence of HSP keeps increasing. The pathogenesis of HSP has not yet been completely understood . Numerous studies have shown significant immune dysfunction during acute phase of HSP, including the disturbance of humoral immunity and T-lymphocyte subsets function, as well as cytokine secretion. Suppressors of Cytokine Signaling (SOCS) families include at least 8 members of cytokine-induced proteins, namely SOCS1 to SOCS7 and CIS (Cytokine-inducible SH2 protein). These molecules negatively regulate Janus Kinase/Signal Transducers and Activators of Transcription (JAK-STAT) signaling pathway to modulate the activation, development, differentiation and function of monocyte-macrophages, dendritic cells and T-lymphocytes, and play important roles in autoimmune and inflammatory diseases [2-5]. Among all members of SOCS family, SOCS1 and SOCS3 have attracted more attention because they are crucially involved in immune diseases [4,5]. However, the roles of SOCS1 and SOCS3 in HSP remain unclear. In this study, we employed RT-PCR to investigate SOCS1/SOCS3 mRNA levels in Peripheral Blood Mononuclear Cells (PBMC) in children with HSP. HSP patients and healthy control children were selected as the objects. Children with HSP were included if they met the following inclusion criteria: age 3-12 years old; exhibited diagnostic criteria for HSP; for children with initial onset, the course was 3 days; 4 weeks without using any corticosteroid or cytotoxic drugs; had no other associated medical problems. Healthy children were included if they met the following inclusion criteria: matched for age and gender of the children with HSP; had no history of allergic disease; 4 weeks without using any corticosteroid or cytotoxic drugs. This study was approved by Hospital Ethics Committee, and all the parents gave informed consent. 2 ml peripheral blood were collected from the children with HSP and healthy controls and put into anticoagulant sodium heparin tube, PBMC was isolated by density gradient centrifugation. The number of PMBC was counted by using a hemacytometer. Total RNA was extracted from 1.5 × 106 PBMC using Trizol reagent (Invitrogen, USA) following the manufacturer’s protocol. The integrity of total RNA was examined by 1% agarose gel electrophoresis. In addition, the absorbance of RNA samples at 230, 260 and 280 nm and ratios of D260:D280 and D260:D230 were calculated to estimate the purity of total RNA. cDNA was produced by reverse transcription at 42°C for 60 min using RT kit (Promega, Madsion, WI, USA) following the manufacturer’s protocol, followed by incubation at 70°C for 10 min to inactive reverse transcriptase. Quantitative PCR was performed using SYBR Green I Kit on ABI Prism7500. The total reaction volume of 25 μL included 12.5 μL SYBR Green qPCR Master Mix (2x), 0.25 μL Forward Primer, 0.25 μL Reverse primer, 0.25 μL cDNA, and 11.75 μL Diethylpyrocarbonate (DEPC) treated water. The primers used were as follows: SOCS1 CTTCCCCTTCCAGATTTG (forward) and TCCAGGCAAGTAATAACAA (reverse); SOCS3 TCTCCTTCAATTCCTCAG (forward) and GTTGGAAAGTTTGAAGATTC (reverse); β-actin ACCCTGAAGTACCCCATCGAG (forward) and ACATGATCTGGGTCATCTTCTCG (reverse). PCR reaction conditions were as follows: 1 min at 95°C for degeneration (one cycle) and then 10s at 95°C, 20s at 58°C, 20s at 72°C for 40 cycles. The relative mRNA levels of SOCS1 and SOCS3 were compared to that of β-actin and calculated by the 2-ΔΔCt method. Each Ct value used for these calculations was the mean of the triplicate for each reaction. SPSS17.0 statistical software was used for statistical analysis. Measurement data were expressed as mean ± standard deviation. Comparison between groups was analyzed by t-test. P<0.05 was considered significant difference. We selected 20 HSP patients, including 11 males and 9 females (mean age 7.36 ± 2.22 years old, range 3-12 years old); and 15 healthy control children, including 8 males and 7 females (mean age 7.24 ± 1.64 years old, range 4-11 years old). The age and gender of the children in two groups showed no significant difference (t=0.175, X2=0.115, P >0.05). The mRNA expression levels of SOCS1 and SOCS3 were detected by RT-PCR. Representative melting curves of PCR for SOCS1 was shown in Figure 1. SOCS1 and SOCS3 mRNA levels were significantly higher in HSP group than in control group (Table 1). These data suggest that abnormal high expression of SOCS1 and SOCS3 is involved in HSP. Figure 1. 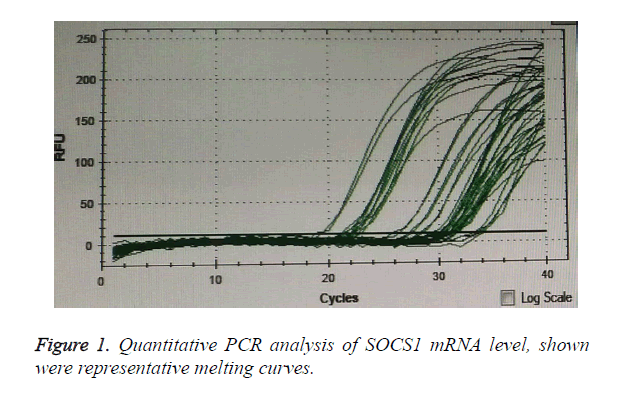 Quantitative PCR analysis of SOCS1 mRNA level, shown were representative melting curves. Table 1. Relative SOSC1 and SOCS3 mRNA levels in HSP patients and controls. The etiology of HSP is complex, involving immune abnormalities, environmental factors and genetic factors. Th cells play an important role in the regulation of immune response. Immune disorders caused by the imbalance of Th cells, in collaboration with other factors, lead to autoimmune diseases. The newly discovered CD4+CD25+ regulatory T cells (Treg) and Th17 cells are important causes of immune imbalance in HSP [6,7]. In addition, a variety of cytokines such as TNF-α, IL-2, IL-4, IL-6, IL-10, IL-26, and IL-28 are implicated in the pathogenesis of HSP. SOCS is not only a target gene of JAK/STAT signaling pathway, but also an important negative feedback regulator of this pathway. SOCS mRNA level is normally low in unstimulated cells but SOCS is induced rapidly at high levels after cytokine stimulation. In addition, microenvironmental factors affect the expression of SOCS mRNA . Recent studies suggest that SOCS1 and SOCS3 regulate Treg cell differentiation and function, especially the balance of Th1/Th2 [9-11]. SOCS1 expression level in Thl cells is 5 times of Th2 cells, while SOCS3 expression in Th2 cells is 23 times of Thl cells [12,13]. SOCS1 can inhibit IL-4/STAT6 signaling, thus inhibiting Th2 cell differentiation and promoting Th1 cell differentiation, leading to enhanced Thl response. In contrast, SOCS3 can inhibit IL-4/STAT6 signaling, thus inhibiting Th1 cell differentiation and promoting Th2 cell differentiation, leading to enhanced Th2 response [14,15]. Therefore, SOCS1 and SOCS3 are involved in many inflammatory diseases, especially in autoimmune diseases associated with Th1/Th2 imbalance. SOCS1 and SOCS3 participate in ocular uveitis, Crohn's disease, systemic lupus erythematosus, rheumatoid arthritis, multiple sclerosis, allergic reactions, asthma, psoriasis, and type I diabetes . In this study, we compared SOCS1 and SOCS3 mRNA levels in 20 children at acute stage of HSP to 15 healthy control children matched at the age and gender. The results showed that both SOCS1 and SOCS3 mRNA levels were significantly higher in HSP patients than in controls. Moreover, the increase of SOCS3 mRNA level was bigger than the increase of SOCS1 mRNA level in HSP patients. Therefore, after the antagonistic effects of SOCS1 and SOCS3, surplus SOCS3 seems to favor enhanced Th2 response and contribute to the development of HSP. Previous studies have suggested that SOCS signaling could be therapeutically targeted for the treatment of various immune diseases [15-17]. Considering our results, we speculate that the dysregulation of SOCS1 and SOCS3 is implicated in the pathogenesis of HSP. The modulation of SOCS1 and SOCS3 expression levels may provide novel therapeutic approach for the prevention and treatment of HSP. Rigante D, Castellazzi L, Bosco A, Esposito S. Is there a crossroad between infections, genetics, and Henoch-Schönlein purpura? Autoimmun Rev 2013; 12: 1016-1021. Labuzek K, Suchy D, Gabryel B, Pierzchała O, Okopień B. Role of the SOCS in monocytes/macrophages-related pathologies. Are we getting closer to a new pharmacological target? Pharmacol Rep 2012; 64: 1038-1054 . Matsumura Y, Kobayashi T, Ichiyama K, Yoshida R, Hashimoto M, Takimoto T. Selective expansion of foxp3-positive regulatory T cells and immunosuppression by suppressors of cytokine signaling 3-deficient dendritic cells. J Immunol 2007; 179: 2170-2179. Tamiya T, Kashiwagi I, Takahashi R, Yasukawa H, Yoshimura A. Suppressors of cytokine signaling (SOCS) proteins and JAK/STAT pathways: regulation of T-cell inflammation by SOCS1 and SOCS3. Arterioscler Thromb Vasc Biol 2011; 31: 980-985. Yoshimura A, Suzuki M, Sakaguchi R. SOCS, Inflammation, and Autoimmunity. Front Immunol 2012; 12: 3-20. Li YY, Li CR, Wang GB. Investigation of the change in CD4+ T cell subset in children with Henoch-Schonlein purpura. Rheumatol Int 2012; 32: 3785-3792. Chen O, Zhu XB, Ren H, Wang YB, Sun R. The imbalance of Th17/Treg in Chinese children with Henoch-Schonlein purpura. Int Immunopharmacol 2013; 16: 67-71. Chinen T, Komai K, Muto G, Morita R, Inoue N, Yoshida H. Prostaglandin E2 and SOCS1 have a role in intestinal immune tolerance. Nat Commun 2011; 8. Trengove MC, Ward AC. SOCS proteins in development and disease. Am J Clin Exp Immunol 2013; 2: 1-29. Yao R, Ma YL, Liang W, Li HH, Ma ZJ, Yu X. MicroRNA-155 Modulates Treg and Th17 Cells Differentiation and Th17 Cell Function by Targeting SOCS1.Immunology 2012; 135: 101-111. Daegelmann C, Herberth G, Röder S, Herbarth O, Giese T, Krämer U. Association between suppressors of cytokine signalling, T-helper type 1/T-helper type 2 balance and allergic sensitization in children. Clin Exp Allergy 2008; 38: 438-448. Shirota H, Gursel M, Klinman DM. Suppressive oligodeoxynucleotides inhibit Th1 differentiation by blocking IFN-gamma- and IL-12-mediated signaling. J Immunol 2004; 173: 5002-5007. Kaplan MH, Schindler U, Smiley ST, Grusby MJ. Stat6 is required for mediating responses to IL-4 and for development of Th2 cells. Immunity 1996; 4: 313-319. Yamamoto K, Yamaguchi M, Miyasaka N, Miura O. SOCS-3 inhibits IL-12-induced STAT4 activation by binding through its SH2 domain to the STAT4 docking site in the IL-12 receptor beta2 subunit. Biochem Biophys Res Commun 2003; 310: 1188-1193. Yoshimura A. Negative regulation of cytokine signaling.Clin Rev Allergy Immunol 2005; 28: 205-220. Liang Y, Xu WD, Peng H, Pan HF, Ye DQ. SOCS signaling in autoimmune diseases: Molecular mechanisms and therapeutic implications. Eur J Immunol 2014; 44: 1265-1275. Kubo M. Therapeutic hope for psoriasis offered by SOCS (suppressor of cytokine signaling) mimetic peptide. Eur J Immunol 2013; 43: 1702-1705.